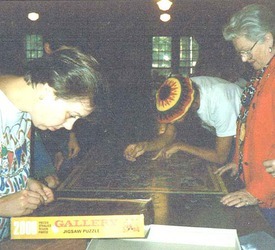 The FNCA had a fabulous 2003 session in August that campers called "the best summer ever", "very productive", "a truly wonderful experience", and what the Rev. Dr. George F. Dole pronounced "a healthy and harmonious gathering that ran without a hitch." 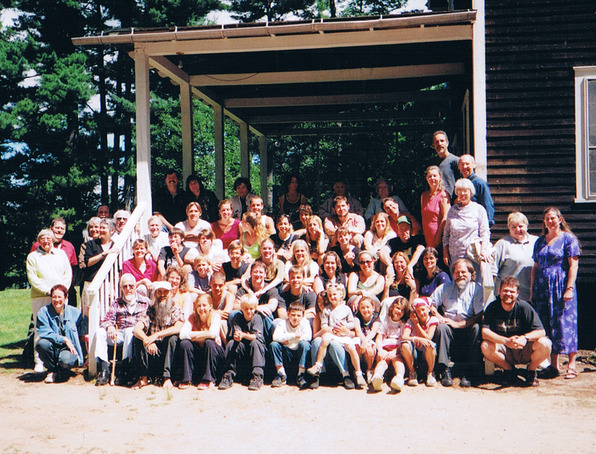 Picture four generations of Swedenborgians gathering for spiritual education, recreation, and relaxation in the midst of tall pines on the banks of the cool, clear Saco © FNCA 2003River. Imagine catching up with old friends and making new ones. See the towering peak of Mount Kearsarge from the comfort of an old rocker on the front porch as you look up from your book, crossword puzzle, or conversation. Taste the nutritious and tasty meals partaken in good company. Hear the big camp bell ringing out it deep tones across the entire camp to announce rising time, breakfast, morning chapel, lectures, lunch, dinner, and special activities. Smell the sweet, cleansing fragrance of the pine forest of Maine enveloping you where ever you go. And get in touch with our strong faith and inspiring teachings through adult lectures and discussions, and children's religion classes. Our theme the first week was "Inside Looking Out" — a compelling and informative exploration of how the New Church views other Christian denominations. And our second week's theme was "The Gospels" — an overview of the first four books of the New Testament. During the middle weekend, we celebrated the Flames 75th Anniversary Reunion. In the late 1920's the young people at camp organized themselves into a group they called The Flames. And old Flames returned in droves, including a few of the orginal founders! © Nancy F. Little 2003Saturday was the high point of the weekend. After our regular morning schedule and lunch was the FNCA Annual Meeting. Afterwards, Flames memorabilia and photos were on display in the Flames' rec hall, Chalmers Lodge. Next, a heartwarming dedication of our newest building: the Adrienne Frank Fellowship Hall, followed by an outdoor barbecue with the tables set up on the front lawn like they used to do every Saturday dinner back in the old days. The evening ended with a long-standing Flames tradition, Stunt Night! But instead of a series of humourous skits, songs of all types, and the silly jokes everyone has come to expect, this one was decidedly different. Much to their surprise, each decade of Flames was called in turn to a row of chairs on the stage. And as the microphone was passed from hand to hand, the crowd reared with laughter and clapped with delight as each Flame shared a fond momory from their time as a Flame. 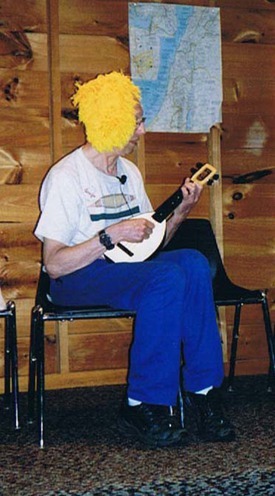 © Nancy F. Little 2003Some groups also offered musical entertainment: with a mop wig and ukulele, the Rev. Dr. George F. Dole of the 40's Flames recreated his Tiny Tim parody "Tinkering with the Toilets" ("Tiptoe through the Tulips"); the 70's Flames offered several humorous songs from their era including "The Swilling Hole Song" ("The Swimming Hole Song") and "Don't Blink the Lights" ("Don't Fence Me In"); and the 90's Flames had us all join in a rousing version of "Sparkle, Sparkle, Little Flame" (you know that one!). © Nancy F. Little 2003Another thing that made our 2003 session decidedly different was the rain. It came down nearly every day. It rained so much that the river rose over nine feet, covering the ramp down to our dock and nearly the entire lower railing. Our beach still hadn't reappeared by the last day of camp. But the wet weather did not dampen our spirits! 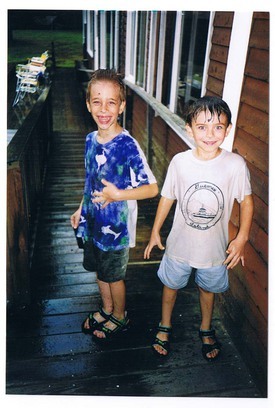 When the weather was clear, many people went to nearby Conway Lake or the Fryeburg town beach for swimming. To the delight of on-lookers, the Flames spent two evenings slipping and sliding on the front lawn and hill in the pouring rain! The Sparks were happy with several new and different indoor activities. And everybody old and young did their best to maintain camp spirit at a high level. There was one sad point: the final year for our wonderful camp cooks, Sally and Bill Fernald. Sally has done a fabulous job of feeding the Assembly for 24 years! And Bill has been with her most of that time. And it was a very teary-eyed version of "We're Sorry You're Going Away" that was sung in a big group hug at their last meal! All in all, the FNCA is an unforgettable and uplifting experience. 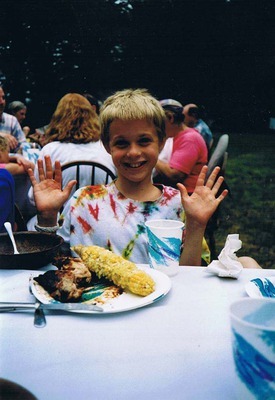 As seminary student Doug Moss put it, "When I first arrived, I felt like I was crashing a family reunion; but by the end of the second day, you had all made me feel like one of the family. I love it!" NOTE: "Reflections" 2001 & 2002 are unavailable, probably non-existant.